Of myself I must say this," spoke Queen Elizabeth I to Parliament on November 30, 1601, "I was never any greedy, scraping grasper, nor a strict fast-holding prince, nor yet a waster." One year earlier the sovereign of England had ordained the Earl of Cumberland and his party as the Crown's sole traders, for fifteen years, in the Indian and Pacific Oceans. King James I reaffirmed the venture in 1609, allowing the East India Company to profit, colonize, conquer and govern a foreign land over the next two and a half centuries. Having acquired the rights to Finnish developer Nitro Games' eponymous title in March, Paradox Interactive has published a game of finely executed strategy, matching Colonial stylings to a worthy mercantile and nautical challenge. explore, profit, aggrandize.Campaign play begins in 1600 under a flag of choice — English, French, Spanish, Danish, Portuguese, Swedish, or of the Holy Roman Empire. The primary objective, trading by sea, is lucid enough. 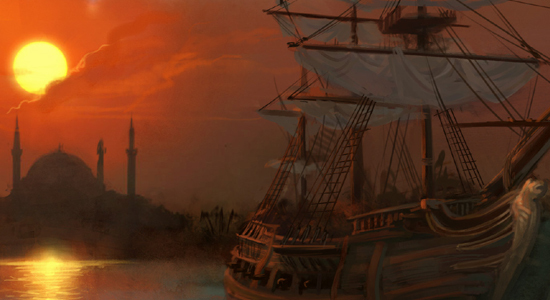 Given a few ships and a small sum of capital, players are instructed to sail a convoy loaded with export to the Indian subcontinent, then return with holds full of exotic goods. Indisputable success of the first voyage encourages permanency and competition, so players race with rival powers to claim an African and Asian port, then angle to outperform, outlast — or extinguish — each contender. With few exceptions, whatever Europe offers to distant markets will sell, while valuables from abroad are precious. Nitro accommodates both informal and meticulous strategists by allowing profit, at normal levels of difficulty, whether or not players draw up a ship's manifest to account for every variable price and seasonal demand. Fleets and their ships' cargo may be controlled directly by a player or left to independently sail along a selected route with the possibility of quick intervention while docked here or there. But on the odd year porcelain might command far more than tea and silk, or a nation could announce great need of goods or raw materials. Players who are shrewd — and patient, as the pricing interface is cumbersome — can quickly amass wealth, and spend money to expand their company's power. As many as one hundred ships, organized in twenty fleets, can be built and launched for commerce or, as priorities shift, battle. All may be named — such as mine, for the English throne, duly christened Formidable, Stalwart and Perennial, with a nod to Patrick O'Brian elsewhere in Surprise. Science constricts design choices initially — definitive tall ships won't be seen until their invention in the late 17th and early 18th centuries — and cost will check a player throughout his administration. Balancing capacity with frequency, two of my fleets consisted of larger, slower brigs and galleons; the other three were light and swift sails. Supplying demand: patience pays off.Pirates and aggressive companies menace. Nitro again acknowledges preferences by offering ship combat that may be played through in arcade, normal or simulation modes; or resolved automatically. Battles are deliberate; which is to say necessarily slow-paced. But, hardly the title's attraction, they amuse while fulfilling a purpose. East India Company's historical mise-en-scene, subtly accurate, succeeds. A stately, anodyne Briton responds to orders and reports news. Period tableau appear on loading screens, and native rhythms complement the game's serene, Classically inspired soundtrack. Some grammatical awkwardness reflects Finnish origin but is compensated by a sharply written narrative. Paradox and Nitro have strong work in East India Company: neither daunting nor facile, familiar yet fresh, well-crafted and fun.